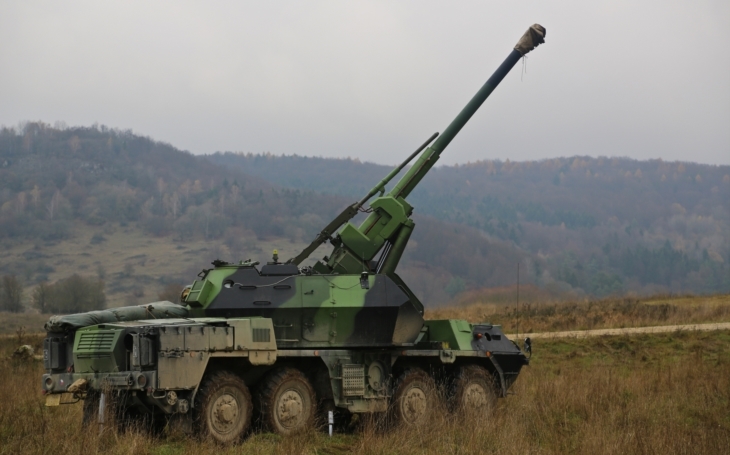 Chapter 4 of the General Staff’s „Modernization Projects of the Czech Army“ document describes requirements for a new Self-Propelled Gun to replace 86 ShKH M77 DANA Self-Propelled Gun Howitzers currently operated by both artillery battalions of the 13th Artillery Regiment. According to the General Staff these vehicles are obsolete and do not answer today's requirements of compatibility with NATO caliber, different types of munition, and with the command and fire-control systems. The DANA („Dělo Automobilní Nabíjené Automaticky“: gun on truck loaded automatically) were introduced in 1970’s. It is a 152 mm Self-Propelled Gun Howitzer (lenght of barrel: 36.6 calibres) based on a modified 8x8 Tatra 813 chassis with excellent cross-country mobility. It comes with a self-loading capacity, and offer a range of fire of 18 km, good accuracy and a rate of fire of three rounds per minute. It is designed to fight enemy artillery and mortars, command posts, fire and radar systems, manpower, permanent and field defensive constructions. Besides the 152 mm howitzer it is armed with a 12.7 mm DShKM machine gun and carries an RPG-7 anti-tank rocket-propelled grenade launcher. The 13th Artillery Regiment is based in Jince, Central Bohemian Region. It is equiped with the DANA howitzers, the reconnaissance and observation system „Sněžka“ based on BVP/BMP-1 IFV, the light reconnaissance and surveillance system „LOS“ based on BVP/BMP-2 IFV, light artillery reconnaissance armoured vehicles „LOV Pz“ based on IVECO M65E19WM LMV, and the mobile counter-battery radar „ARTHUR“ by the Swedish Saab. DANAs are operated by the Czech Republic, Libya, Poland, Georgia, Azerbaijan and Slovakia, which deploys a modernized variant named „ZUZANA“: a 155 mm NATO caliber Self-propelled Gun with a 45-caliber barrel, with range of fire of 39.6 km. 52 self-propelled guns in total. Lenght of barrel 52 calibers. Special and precision guided (PGM/PGK). At least 5-6 rounds per minute. At least 7.62 mm NATO caliber machine-gun. Protection against artillery shrapnel and infantry weapons.